Tiny particles called quantum dots reduce symptoms in mice primed to develop a type of Parkinson’s disease, and also block formation of the toxic protein clumps in Alzheimer’s. They could one day be a novel treatment for these brain disorders, although tests in people are some years away. Quantum dots are just a few nanometres in size – so small they become subject to some of the strange effects of quantum physics. They have useful electronic and fluorescent properties and are found in some TV screens and LED lights. Unlike most medicines, their tiny size means they can pass from bloodstream into the brain. Byung Hee Hong of Seoul National University in the South Korea and his colleagues wondered if they would affect the molecules involved in Parkinson’s or other brain disorders. Parkinson’s disease involves gradually worsening tremors and movement problems. It is thought to be caused by a protein called synuclein found in nerve cells folding into the wrong shape, which triggers a chain reaction of misfolding in nearby synuclein molecules. 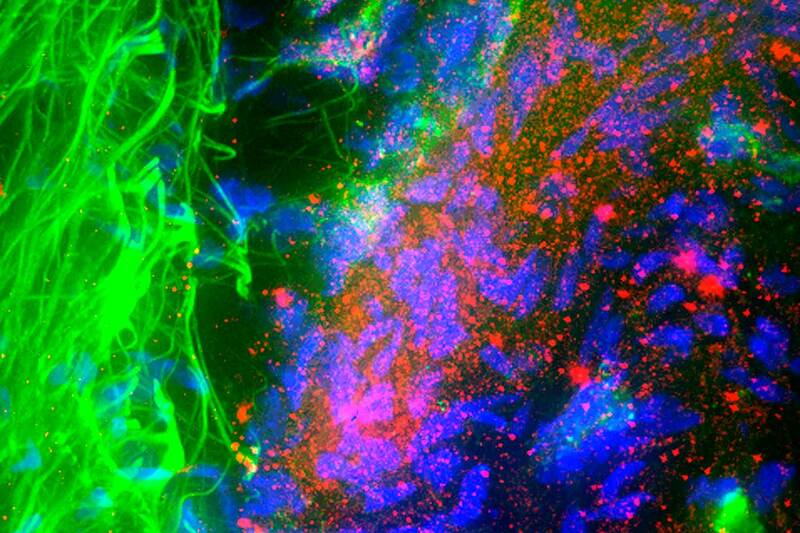 This leads to a build-up of long strands or “fibrils” of the protein, killing neurons. Hong’s team found that in a dish, quantum dots made from graphene – a form of carbon – bind to synuclein, and not only stop it from clumping into fibres, but also cause existing fibres to break up into individual molecules. “We didn’t expect the quantum dots to induce disaggregation of fibrils,” says Hong. Next the team injected quantum dots into mice dosed with fibrils, which normally trigger gradually worsening movement problems. Six months later, the mice showed improvement on two different physical tests. Another team has found that quantum dots show promise for Alzheimer’s disease; in a similar fashion, they bind to a protein called amyloid, and reduce it from clumping together, a process thought to be involved in this dementia. However tests in an animal version of Alzheimer’s haven’t yet been reported. “This might be a universal effect on any kind of fibrillation process related to disease,” says Hong. His team is investigating using quantum dots in Alzheimer’s and motor neuron disease – the condition that affected Stephen Hawking – which also involves protein clumping. Hong says if safety tests in animals go well, they hope to start trials in people in about two years.